1. 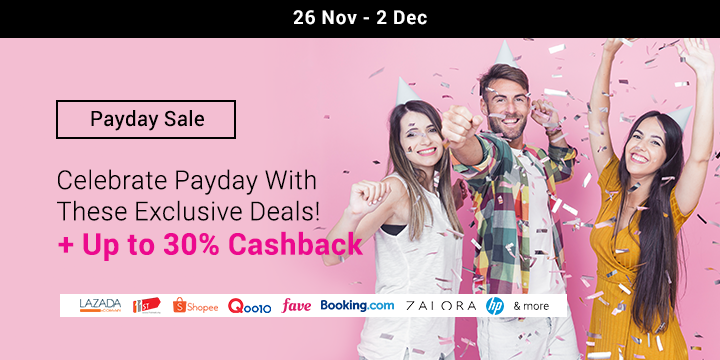 Promotion is valid from 1 December to 9 December 2018. - ShopBack users who have never made a purchase (New Customers). - ShopBack users who have made a purchase (Existing Customers), but have never made a purchase using Cashback Buddy extension. 3. Limited to one-time RM5 bonus Cashback per customer. 4. RM5 bonus Cashback is limited to first 1,000 customers only. 5. User is required to pay the price shown on the merchant's website first. After purchase, usual store Cashback will be credited into account. Remaining RM5 Bonus Cashback will be credited by 4 January 2019. 6. Any order returns, refunds, cancellations and failed payments will be disqualified from this promotion. 7. Orders that are 1) not made via ShopBack, or 2) suspected to have fraudulent intent (eg. creating multiple ShopBack accounts), will not qualify for the Bonus Cashback. 8. Not valid with other ongoing promotions and code featured on merchant’s website. 9. ShopBack reserves the right to modify, amend or discontinue any part(s) of this promotion without prior notice.